It's a shame that Kimmel didn't provide a number to call for the tens of millions of Americans who have seen their premiums and out-of-pocket costs skyrocket under Obamacare's strictures. In recent months, late-night talk show host Jimmy Kimmel has taken to scaremongering his audience with well-worn Democratic Party talking points regarding health care insurance policy. Between yuks, he occasionally accuses Republicans of being would-be baby killers, which is treated as an important political development because, well, Jimmy Kimmel is famous. This week, the comedian was back to explain why the new Graham-Cassidy Republican "repeal" bill is bad news. There were only two things wrong with his monologue: Almost everything he said was either completely untrue or highly misleading, and his simplistic emotional appeal was completely disconnected from the real world. The comedian's interest in policy was sparked by the harrowing experience of having a newborn son who suffered from a rare health condition. Thankfully, his boy is OK. "If your baby is going to die and it doesn't have to, it shouldn't matter how much money you make," said an emotional Kimmel in May. "I think that's something that, whether you're a Republican or a Democrat or something else, we all agree on that, right?" Yes, everyone agrees. As far as I know, there isn't a single politician in America who has ever supported allowing babies to die because they are born with birth defects, even if the parents can't pay. Not pre-Obamacare, and not post-Obamacare. In any event, after Kimmel's May rant, Louisiana Sen. Bill Cassidy showed up on his show to explain his position. These types of culture encounters shouldn't be dismissed, because the fact is most viewers are unaware of specific policies and have a notional understanding that's prejudiced by the establishment media's coverage. Cassidy came up with something he called the "Jimmy Kimmel Test," a test that no "family should be denied medical care, emergency or otherwise, because they can't afford it." Kimmel claims that the new bill doesn't meet this threshold. "This guy, Bill Cassidy, just lied right to my face," the talk-show host said on Tuesday night during an extended political rant. He went on to say, "And by the way, before you post a nasty Facebook message saying I'm politicizing my son's health problems, I want you to know: I am politicizing my son's health problems." OK. He explained: "Coverage for all? No. Fact, it will kick about 30 million Americans off insurance." Not a single person would be "kicked off" his or her insurance. Rather, the Congressional Budget Office review of the AHCA found that of the 24 million Americans who would no longer have health insurance after an Obamacare repeal, 14 million would choose not to buy insurance in 2018 in the absence of a penalty. And if Obamacare were not repealed, the CBO projects another 6 million people would voluntarily leave the Obamacare markets. Now, if you don't believe Americans should be afforded the choice to leave or not buy insurance, just say that. No one is being kicked off. Moreover, if Kimmel supports the individual mandate, Graham-Cassidy allows California to institute it—as I am sure it would. Kimmel says: "Pre-existing conditions? Nope. If the bill passes, individual states can let insurance companies charge more if you have a pre-existing condition." States would be allowed to apply for waivers to change what qualifies as an essential health benefit as long as they still preserve "adequate and affordable health insurance coverage" for people with pre-existing conditions. You may prefer price fixing to allowing states flexibility to try and fix these problems, but Graham-Cassidy does not break the "Jimmy Kimmel Test." Kimmel might not be aware that there is no plan in place that has government cutting checks after every surgery. Kimmel then implored his audience to call Cassidy to stop the imaginary bill he had just described. It's a shame that Kimmel didn't provide a number to call for the tens of millions of Americans who have seen their premiums and out-of-pocket costs skyrocket under Obamacare's strictures. Is there no number available for those who are sick of being in exchanges that coerce them to buy plans they don't need that are sold by companies they don't like in fabricated, noncompetitive "markets" with dwindling choices? Anyway, so went a monologue that could have been written by any liberal activist. Which is to say it was all about cheap zero-sum emotionalism. Kimmel doesn't believe Americans deserve the chance to reduce the cost of health care with market-based reforms on the state level, or in giving states any flexibility in catering their plans to their own citizens. Kimmel believes California and New York should spend more per capita and smaller states should suffer. 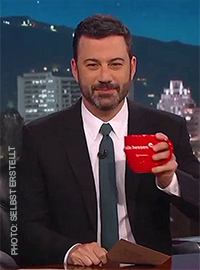 Kimmel doesn't believe that individuals and families should be allowed to contribute to health savings accounts or use them to help pay ever-growing insurance premiums. Kimmel wants average Americans to suffer. You see? Anyone can play this game.